I’m not a huge fan of the Donruss Triple Play brand. Personally, I did not find that the cards were very exciting. And I also thought that the large, shifted frame that held the player’s picture took up too much space and limited the effectiveness of a nice, larger image. 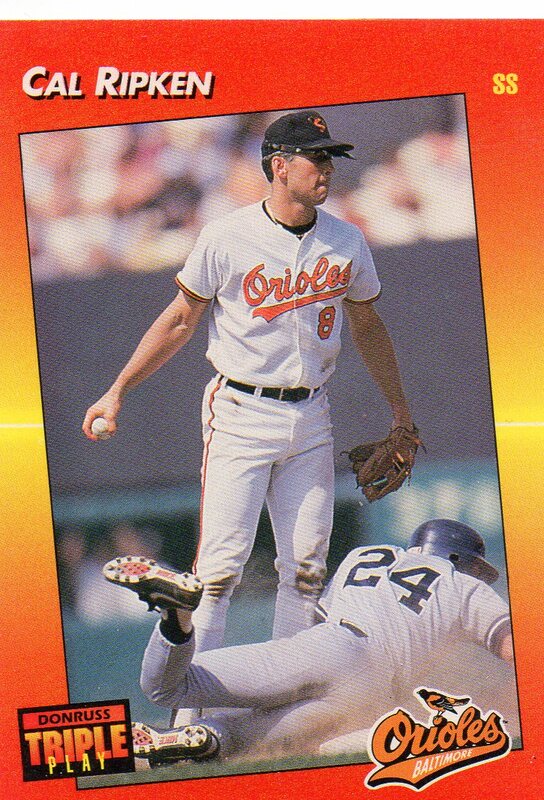 But, this Cal Ripken card from the 1992 set escapes that criticism. This card is sweet! A fine addition to my Cal Ripken Jr. player collection. Both of these guys, in different ways, have cemented themselves in my baseball memory and built images in my head that will last for my lifetime. 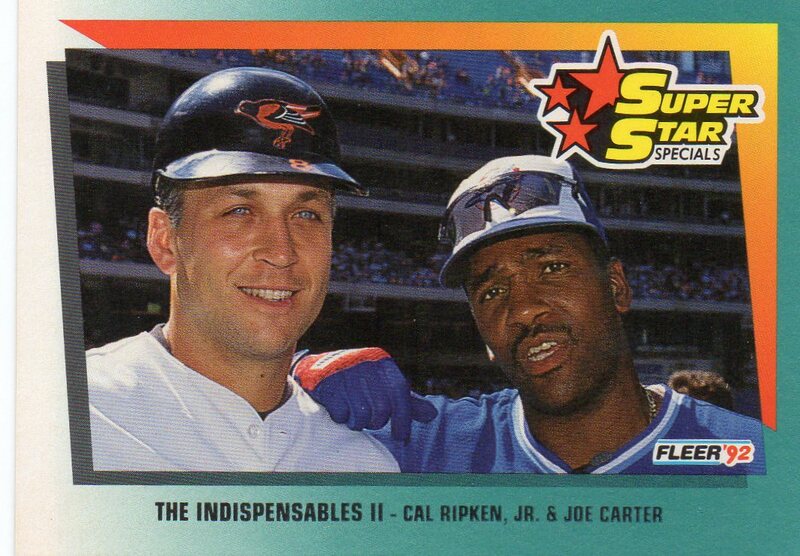 Joe Carter hit the home run that all kids dream of as a kid. World Series drama, walk-off game winner, series clincher – You name it! With one swing, Joe Carter cemented himself as a baseball legend who shined the brightest when all eyes were on him. Cal Ripken built such an incredible baseball resume, and he did it the right way. 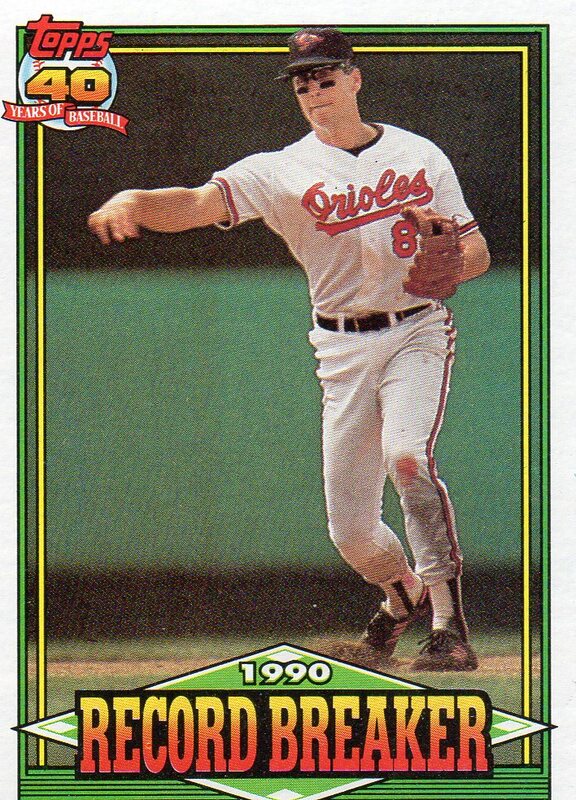 A consummate professional, Ripken played the game the right way and he did it for the pure love of the sport. A tremendously skilled all-around player, Cal has no weakness on the field, and he took that to his off-the-field persona once he retired from the sport. The 1991 Upper Deck design still offered quite a bit of similarity to the 1989 and 1990 products that preceded it. But, I am not complaining! The 1989 Upper Deck set is a classic with a timeless design. And the 1991 version, looks just as good. I told you – it is a beauty!! In today’s collecting world, this would not work as collectors demand innovation and new designs from card companies with each and every new release. 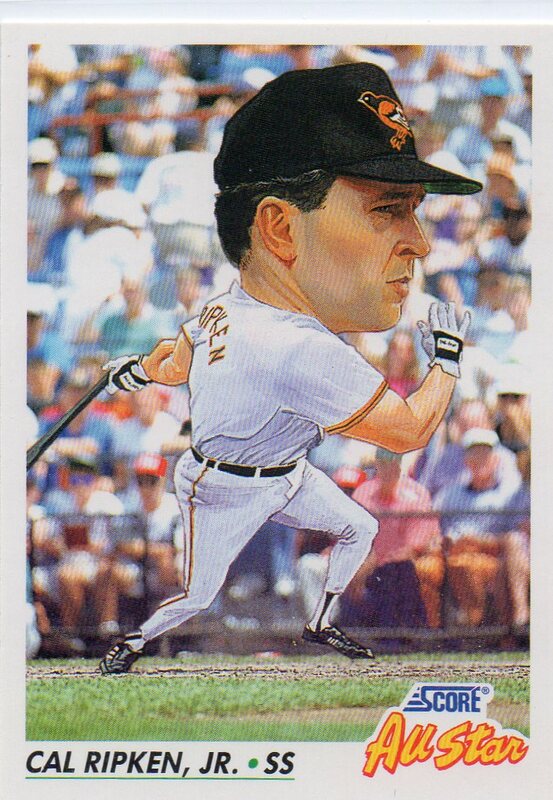 Baseball caricatures became all of the rage in the late 1980’s. I know that I had a few t-shirts that sported some of my favorite players likenesses on them. And I believe that I had a pennant or two as well. Well, Score took it to another level in 1992 when they inserted an All-Star set in their 1992 flagship set that honored the best players in the game. Certainly deserving of a spot on the checklist, this card of Cal is super. I love the details, and even more, I love the fact that I absolutely recognize the caricature as #8. 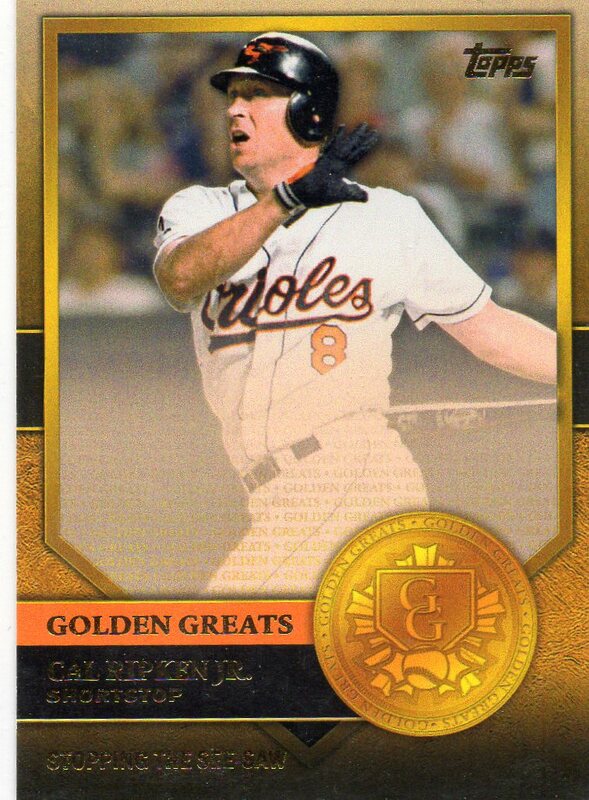 Cal Ripken Jr. 1996 Upper Deck – Home Run Trot OR Base On Balls?? Well, I have another card here where I cannot tell what the outcome of the action is. 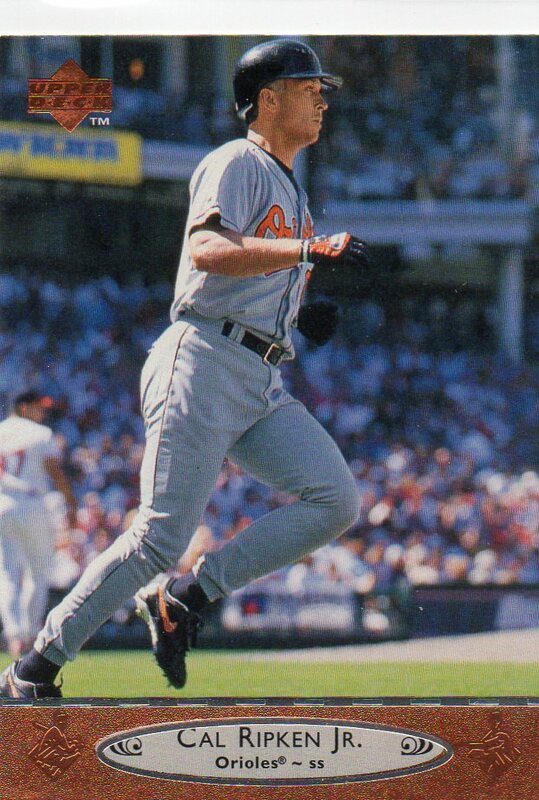 Is Cal Ripken getting into his home run trot or has he been walked to first base? The card you are looking at comes courtesy of the 1996 Upper Deck set. And it has left me scratching my head. I don’t know about you, but I am a huge fan of the baseball card that celebrates a team or player achievement. Regardless of the scale of the event, if the moment is worth mentioning and getting a card, I am in favor of it. In 2012, Topps gave us the ‘Golden Greats’ set. This card celebrates the game-winning home run that Cal launched against the White Sox on July 13, 1984. The 3-run blast came in the bottom of the 11th inning after the White Sox scored in the top of the inning to take the lead. With the home run, Ripken secured victory for his team and sent all Orioles fans home with smiles on their faces. Now this one is a sweet one!! This card comes from the 1991 Topps baseball card set and it is part of the ‘Record Breakers’ subset. I like the look of the card with the 40th Anniversary logo in place in the upper-left corner, and the prominent ‘Record Breaker’ tagline at the bottom truly calls out what makes this card special. For me, the only thing that is missing from the front is some kind of hint as to what the record was. I like the way that it was done in 1985, and I wish that Topps carried that style forward with other issues. A little hint or tease as to what is printed on the back would have been nice – give us a reason to pause and read the back of the card! 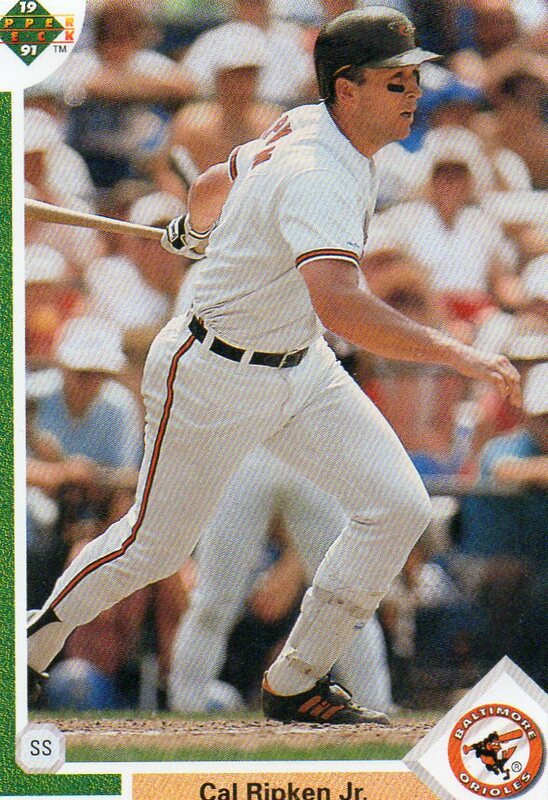 As an FYI, this card is celebrating the fact that Ripken had an errorless games streak of 95 consecutive games at shortstop in which he handled 431 plays before making another error.